Johnny's Trading Spot: 2019 Topps AS Rookie Cup cards. A blog about the cards I get awesome deals on, cards that I have available to trade, trades and our hobby in general. I collect Braves cards (all of them) and T206 White Borders. I also collect anything John Elway see my Elway blog for that. 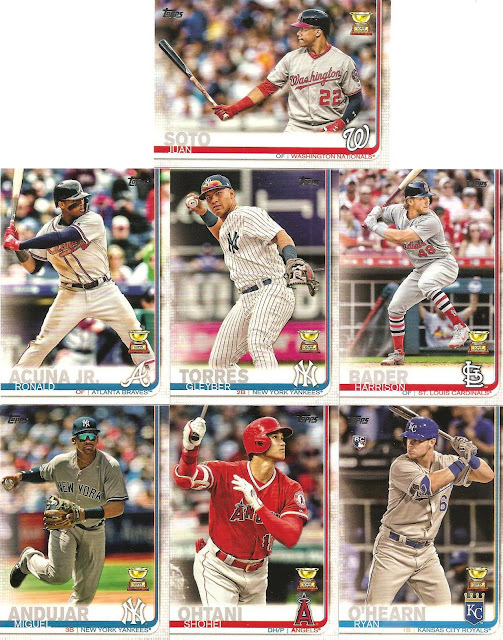 2019 Topps AS Rookie Cup cards. Keeping it short again today. here are the Cup cards released in series 1. I might as well as put in my two cents on the 2019 Topps. Right away I noticed that the cards stock is thinner, almost flimsy to me. This is going to make it really easy to get corner dings. As for the design, i liked 2018 much better. I do like the borders, but I think last year was a better looking card. I haven’t seen these all together. I have never heard of Ryan O’Hearn. Flimsy card stock. Didn't wanna hear that. I've got a blaster waiting to be opened up. Maybe tonight after dinner. Soto looks like Jim Thome / Ryan Howard there with that pointed bat - I wonder if he had Charlie Manuel (or a student of Charlie's) as a hitting coach in the minors. I only have the O'Hearn so far, but it shouldn't be hard to find the rest of these. I think the cup is a little small on this year's card. Link to all of my Want lists! T206 Braves: Beaumont, Beck, Becker, Bowerman, Dahlen, Ferguson, Graham, Herzog, Lindaman, Mattern, Ritchie, and Starr. 1952 Topps NEEDS: 252, 264, 267, 288, 289, 293, 302, 360, 367, 388, 393, 407. Also UPGRADE 162. Any 1887 Braves coins/cards OR any other super vintage Braves stuff. 1953 Topps: 91, 106, 117, 124, 147, 197, 208, 215, 217, 310, 321. 1954 Topps: 59, 206, 210. 1955 Topps: 47, 155, 161. 1956 Topps: 31 1957 Topps: 283. 1958 Topps: 10, 30, 270, 351. 1959 Topps: 40, 54, 212, 322, 571. 1960 Topps: 300, 515, 534, 566. 1961 Topps: 98a (red letters), 98c (white 98 on back), 200, 415, 426, 463b, 524, 577, 583, 589. 1963 Topps: 126, 253, 347, 390, 429, 431, 460, 481, 503, 519. 1965 Topps Braves #s 2, 487, 500, 542. 1966 Topps Hank Aaron #215. 1970 Topps #710 Millan. Upgrade Aaron's # 462, 500. 1975 Topps MINI's #s 195, 310, 442, 660.